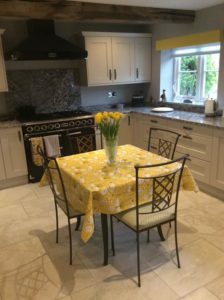 Home Uncategorized January 2019’s Tablecloth of the Month competition winner! January 2019’s Tablecloth of the Month competition winner! January 2019’s winner is Lorraine Evans! Congratulations to Lorraine Evans! 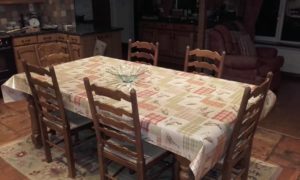 You are the winner of JustWipe’s “Tablecloth of the Month” competition for January 2019! A £20 Marks & Spencer voucher is on its way to you. 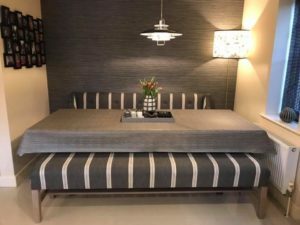 We had some amazing photographs last month but after much deliberation we chose Loraaine’s ‘Pinstripe Charcoal’ matt vinyl tablecloth as our winner. If you are a fan of this stylish wipe clean tablecloth, you’ll be pleased to know that it also comes in a choice of two other colours – Mulberry and Red. Here are some of our favourite tablecloth photos from the last month.